Versatile, sticky, large sized bolete mushrooms are one of the chef's favorite mushrooms. These well-known mushroom fruit bodies found ubiquitously in the temperate, highland forests of USA, Europe, Siberia and China. In United Kingdom, they often recognized as "penny bun" for their light-brown, large, spongy cap which appears like a bun from a distance. Porcini is the popular Italian name for bolete. Botanically, they belong to the family: Boletaceae, and the genus: Boletus. Photo courtesy: Charles de Mille-Isles. Bolete mushrooms are also called "cep" in the UK and France. 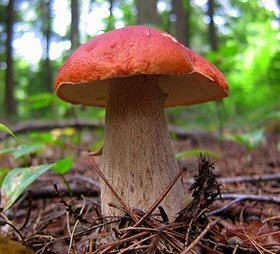 They usually appear in groups, especially in the coniferous (spruce species) forest of temperate regions where they grow in symbiotically (ectomycorrhizal fungi). New fruit bodies harvested in the late summer and autumn. Bolete is recognized by its large, smooth, glossy cap with a white rim. The underside of their cap is covered with vertical tubes resembling pores rather than gills. Its club shaped, broad based stalk is white, woody, and firmly attached to the cap. Several sub-species of bolete mushrooms found ubiquitously in the dense forests of Northern Hemisphere. Boletus reticulates, also known as "summer cep" grows under deciduous, oak (Quercus) trees. It is distinguished from B. edulis by its large, dark chocolate, reticulate (hence the name) cap and absence of a white margin. Boletus pinophilus (pine bolete or pine cep) grows mainly under pine, fir or spruce trees. They feature large, dry, reddish-brown cap measuring 4-10 cm tall by 3-8 cm wide. B. edulis is low in clories. Nonetheless, this flavorful forest forage carries several phyto-nutrients, natural antioxidants, minerals and vitamins. Porcini (bolete) mushrooms are also a rich in dietary fiber and are low in both saturated and unsaturated fat. Dietary fiber helps stimulate digestion, and relieving constipation problems. Bolete mushrooms contain good amounts of easily digestible natural proteins. Additionally, B. edulis carry several natural antioxidants such as vitamin C, ergothinene, flavonoids, and phenolic compounds. Boletus mushrooms are excellent sources of minerals such as selenium, manganese, zinc, copper, iodine, and molybdenum. Furthermore, mushrooms are modest sources of vitamin-D (ergo-calciferol). Vitamin-D plays a vital role in the calcium and phosphate metabolism. They contain ample concentrations of B-complex group of vitamins like thiamin, riboflavin, niacin, pantothenic acid, pyridoxine, etc. Fresh harvest bolete (porcini) can be available in the markets from June till November. Dried whole and slices in vacuum packs are kept for sale in many supermarkets can be readily available all round the year. Choose fresh, whole, soft, and young bolete mushrooms. Avoid very large since they past their prime, hence out of flavor. Some species quickly turn blue if left cut of broken. Also stay away from moth-eaten, larvae stridden, slimy and broken bolete. Once at home, use them early. Place them in cool dry place in a wooden basket away from sunlight and moisture. Keep in the fridge for a few days, in a paper bag or a dish covered with a clean cloth. Store dried boletus (porcini) in a container and place in cold, dry, and dehumidified place. Eat bolete mushrooms as soon possible after purchase to enjoy their unique, mushroomy flavor. Bolete mushrooms are usually clean except for the base of the stem, which often must be removed (too ripe or containing worms) or brushed. Remove the pore surface underneath the cap if it is slimy. Bolete mushrooms sometimes eaten raw, especially porcini mushrooms. However, cooking brings out their earthy flavor to the fore. They can employed in the same way as other mushrooms and can be substituted for other mushrooms. Dried bolete should be soaked in water and revitalized before adding them in cooking. Soak them in either hot or cold water for about 15-20 minutes until rehydrated. Do not discard the soaking liquid as is very flavorful and use it to prepare stock, or add in soups, sauces, stews, and stir-fries. Fresh bolete are delicious braised, sauteed, stir-fried, marinated or grilled. Risotto al porcini- dried or fresh, sliced porcini added in the popular Italian rice preparation complemented with onion, garlic, parsley, and cooking white wine. Most French restaurants offer sauteed cepe in garlic oil or butter. Finely sliced cep is delicious in soups, sauces, pasta dishes, rice, stews, and stir-fried dishes. Large cep caps can be employed in the stuffing. Fine slices can also be added in pizza, pasta, pastry, and potpie preparations. Like other wild mushrooms, porcini also complement well with seafood, lamb, and poultry in a variety of mouth-watering recipes. Allergic, intolerance reactions to porcini mushrooms is rare. Being large and brimming with conspicuous features, bolete are one of the easiest mushrooms to forage. Sometimes they be confused to devils's bolete (Rubroboletus satanas) by the beginners while hunting. R. satanas has similar shape as bolete but can be easily distinguished by their red stem and blue stains at the break ends. (Medical disclaimer). <<-Back to Mushrooms from Bolete mushroom. Visit here for an impressive list of edile mushrooms with complete illustrations of their nutrition facts and health benefits. Composition and antioxidant properties of wild mushrooms Boletus edulis and Xerocomus badius prepared for consumption.